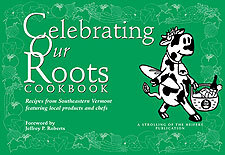 The Strolling of the Heifers (SOTH) is hosting a Recipe Tasting of dishes prepared by local chefs to mark the publication of its "Celebrating Our Roots Cookbook." The tasting takes place during Gallery Walk on Friday, November 2, 2007, from 5:00 to 8:00 pm at the Robert H. River Garden, 157 Main St. in Brattleboro. Approximately 20 of the 106 recipes featured in the cookbook, published by the nonprofit in partnership with the Brattleboro Reformer, will be prepared by some of southeastern Vermont's best-known cooks. Alan Greenleaf and The Doctor will provide musical entertainment. Tickets to the event are $5, and the public is invited to attend. Cookbooks will be available for $19.95, and ticket holders will each receive a $5 credit toward the price of one copy. The cookbook was the outgrowth of the SOTH's year-long Celebrating Our Roots' Recipe Contest, created to build public awareness regarding the organization's ongoing "Buy Local" Challenge Campaign. The campaign's purpose is to educate people about how buying locally helps support southern Vermont's family-owned farms. The public was invited to submit their favorite recipes, preferably those with fresh, local ingredients. Recipes had to be original and were judged on their distinctiveness, taste, and ease of preparation. Those submitted range from down-home, comfort food to gourmet dishes. The top three recipe contest winners received public recognition and cash prizes at an event this past spring that gave the public a chance to taste the prize-winning recipes. All of the recipes in the cookbook were taste-tested by either the Strolling of the Heifers' Executive Director, Orly Munzing, or Cookbook Committee Chair (and award-winning chef), Phyllis Trier. The following chefs and food purveyors will prepare samples of their creations for Gallery Walk Night: Amy's Bakery Arts Cafe, Boccelli's on the Canal, Brattleboro Food Co-op, Orchard Hill Breadworks, Chesterfield Inn, Elizabethan Fare Catering, Grafton Cheese Co., Horizon Organic, Meadowlark Inn, The Old Tavern at Grafton, Orchard Hill Breadworks, Organic Cow, Organic Valley Family of Farms, The Putney Inn, Putney Food Co-op, Riverview Café, and Top of the Hill Grill. For further information visit www.strolllingoftheheifers.com.